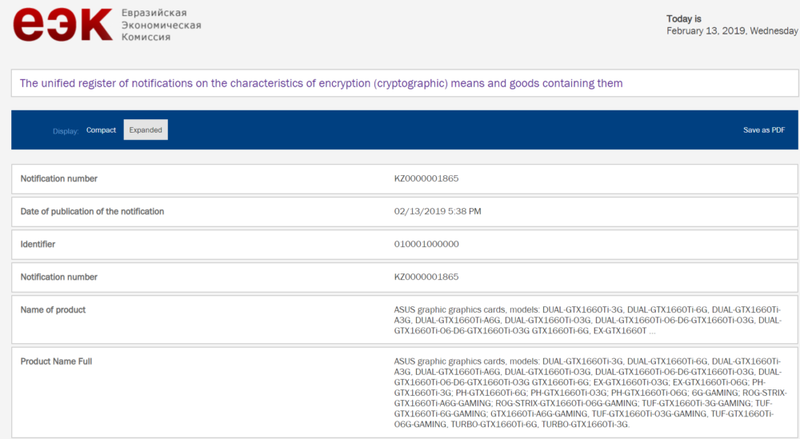 Eurasian Economic Commission website now lists upcoming ASUS GTX Turing series. It may appear that GeForce GTX 1660 Ti will at some point be available in 3GB variants. According to the leak from EEC, ASUS is planning quite a few models featuring 6GB and 3GB memory configurations. The 6GB variant may be exclusive to ROG STRIX series though, as there is no such product with 3GB memory listed. ASUS will launch DUAL, Expedition, Phoenix, TUF (the new series), Turbo and ROG STRIX series of GeForce GTX 1660 Ti graphics. Models are as always divided into Advanced, OC and non-OC variants (which basically feature different clock speeds). The GTX 1660 Ti graphics cards will be announced on February 22nd. We expect a large list of custom models to be available at launch as GTX 1660 Ti basically replaces GTX 1060, the most popular SKU in NVIDIA offer.